The Pittsburg Police Department consists of one full-time Chief and three part-time officers. It is important to note that we do not have twenty four hour seven days a week coverage. We do strive to have an officer on duty for at least eight hours seven days a week. Our Dispatch is located in Colebrook and they have 24/7 coverage. 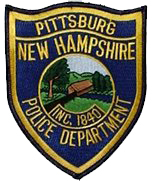 In the event that no Pittsburg Officer is available, New Hampshire State Police handles emergencies. The New Hampshire Fish & Game and the US Border Patrol are also available to assist when called upon. In addition to covering Pittsburg, we have an agreement with the Town of Clarksville to respond to calls in Clarksville . As you can see we have a very large area to cover. We use grants to help off set the cost of maintaining our equipment and to supplement additional patrol hours. These include ATV Patrols and Operation Stonegarden Patrols. Both of these programs are 100% funded by the State of New Hampshire and the Federal Government. We are as well equipped as any agency our size. We have a large command post trailer, a Can-AM Commander 1000 side-by-side fully equipped with radio, lights and siren, a Cam-Am Outlander XT, a 2018 Chevrolet Tahoe cruiser, a Ford Utility truck that is capable of pulling the Command Post and other trailers, 2 snowmobiles and two enclosed trailers that house the snowmobiles and the ATV’s. Our officers carry .45 caliber semi-auto pistols and we have three semi-automatic rifles and a shotgun in the cruiser. Our mission is to make Pittsburg a safe place to live and visit. Members of the Police Department are: Chief John LeBlanc, Officer Vinny Scarnici, Officer Brendon McKeage, and Officer Richard Dube.